With a win over Cleveland on Saturday, Chicago recorded its 30th victory of the 2010-11 campaign, third most in the Eastern Conference. To put it into perspective, last year’s team didn’t get win No. 30 until Feb. 24. By improving to 31-14 with another win over the Milwaukee Bucks on Monday, the Bulls kept pace with the record of the Michael Jordan and Scottie Pippen-led team that won the organization’s first championship 20 years ago. But what’s really remarkable about the Bulls is that they’ve enjoyed this success, including a 21-4 record at home and wins in 21 of their last 27 contests, without ever having the core of Derrick Rose, Carlos Boozer, Joakim Noah and Luol Deng on the floor together at full strength. Rose and Deng have remained healthy and while Boozer and Noah did play together for a stretch, by the time Boozer debuted on Dec. 1, Noah was already playing with his thumb injury suffered on Nov. 27. That being said, Bulls coach Tom Thibodeau is far from satisfied. And in spite of the team’s relatively gaudy record, he knows there is a lot of room for growth. It’s safe to say the Bulls didn’t play their best basketball in an underwhelming win over the Cavaliers on Saturday which extended Cleveland’s losing streak to 16 games. What appeared to be an inevitable blowout instead turned in to a far too competitive game for Chicago’s taste. Thibodeau addressed some of the lapses that occurred and shared his thoughts on how to prevent them moving forward. Thibodeau added that he was pleased with parts of the Bulls’ performance against Cleveland, citing a 17-point first half lead which was extended to 20 points in the second half. But he said he didn’t like the way the Bulls played with the lead and the result was the Cavaliers getting to within two points late in the game. 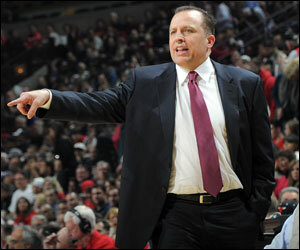 “We have to strive to be a 48 minute team,” stated Thibodeau. There is some consistency, however, developing on the defensive end for Chicago. The Bulls are the NBA’s best team in terms of opponent field goal percentage (.423) and third overall in opponent scoring (92.1 points per game). Furthermore, in their last four games prior to Monday, the Bulls held their foes to 80.8 ppg and .364 (117-321 FG) shooting from the field. In sticking with the theme, there is no chance the success will come with any degree of complacency for Thibodeau and his players. Milwaukee Bucks coach Scott Skiles credits part of Chicago’s success on the defensive end of the floor to a player known primarily for his offensive skills prior to this season. “One of the keys to me is that Derrick Rose has become a better defender,” said Skiles. “He must be willing to listen and learn because they’re good teachers as well [on the Bulls’ staff]. It’s a very good defensive team now, and with the offensive weapons they have, it’s a legitimate club. Earlier this season, Chicago took the first game of the series 90-77 at the UC … both Carlos Boozer and Luol Deng scored a team-high 24 points, while Derrick Rose added 18 points and 12 assists … Milwaukee won last year’s season series 3-1 … in their first meeting last season, Chicago squeaked out a victory over the Bucks at the UC 83-81 (11/03) … Luol Deng had the first 20-20 double-double by a Bull since 2004 (Marcus Fizer) with 24 points and a career-high 20 boards, while rookie Brandon Jennings scored a game-high 25 points for Milwaukee … since the 2003-04 season, Chicago has gone a combined 18-7 against Milwaukee (11-2 at the UC) … since the 2004-05 season, Chicago holds a 7-5 record against the Bucks at the Bradley Center … Chicago has won nine of the last 10 contests over Milwaukee at the United Center … the Bulls won the season series 3-1 in 2008-09, with their lone loss coming in Milwaukee (12/03) … Chicago is 6-4 against the Bucks in its last 10 meetings with Milwaukee.